Over the past few years, a number of online marketing events have shaped my career, and fundamentally changed not only me as a person, but what I believed I could achieve. In that time I’ve moved from being an SEO affiliate, to Inbound Marketing Director at Expedia, via Head of SEO at Omnicom – the world’s largest ad agency. 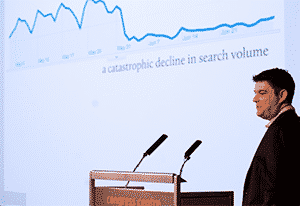 The first true search marketing only event I ever attended was quite late relatively speaking – SMX London in 2009. Prior to this I’d attended casino affiliate industry events, but they were pretty short on the inspiration and value. I can still remember that SMX like it was yesterday though. I showed up by myself. I knew nobody. I don’t recall talking to another attendee on either day I was present. The event itself was far smaller than contemporary SMX/SES’s, and had a fairly rough and ready feel to it. They have certainly become more polished, but then prices have doubled since then. There were some standout presentations in that conference that opened my eyes though, without having seen those I doubt my path would have lead me to write this post today. Will Critchlow presented an advanced analytics session, mainly talking about excel, which blew me away and made sure I doubled down on my excel and VBA knowledge. Rand Fishkin presented on a couple of panels, and his presentation style was clearly head and shoulders above any of the European speakers. In the Give it Up session at the end of the two days, Mikkel DeMib talked about linkbuilding – and discussed exactly what I’d been doing for years. This 10 minute talk felt like validation of what I’d spent the past 7 years doing. I was asked (well, my boss at the time, James Hamlin was asked, but couldnt attend) to speak at a Pizza and Beer style meetup in the Moo.com offices – on whats since been dubbed silicon roundabout. That event, small as it may seem changed my life like no other. These informal evenings have since become a thing of legend, recently featured as part of a Wired article as one of the reasons that London’s digital scene really took off. 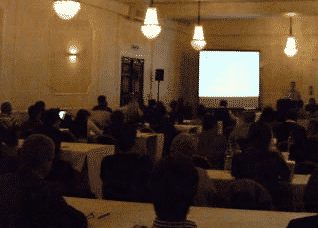 I sat politely and watched a number of people speaking, also on the card for the evening was Will Critchlow (I think that was the first time we’d spoken properly), and at the end of the evening I presented what was meant to be a 15 minute slot on SEO. I’d come prepared with slides, and never having spoken in public before I was terrified. I styled my presentation in the form of a Rand Fishkin presentation, knowing that his sessions at SMX were hands down my favourite presented, and the content in the style of Mikkel DeMib, as those spoke to me more than any other. It went well. I’ll never forget those 40 minutes of a 15 minute presentation. Will Critchlow asked me (still not sure why exactly) to present a 40 minute session on what I’d uncovered in my MayDay update testing – which was a hot topic at the time. My deck was built a month in advance. It was rehearsed non-stop, every night for that month. When the time came, for some reason I defaulted into my fathers Lancashire accent (still not sure why either) but it was well received. I was asked to speak at several other events within a few days, and other offers came along with each new conference I spoke at. I always said yes. Alongside the offers, I badgered some poor conference organisers into letting me speak, and now just three years later I’ve been fortunate enough to speak at around 40 around the world. These Conferences Shaped my Career. Pretty much every amazing opportunity I’ve been lucky enough to enjoy since 2010 have come about through speaking at events, being inspired to do a better job & being taught how to think, in ways that were unimaginable to me just five years ago. From those early days where Rand’s confidence and Mikkel’s attitude wowed me, right up to contemporary conferences like SEOktoberfest, with its insane lineup with the likes of Kris Jones who has inspired me to strive for greater goals than I could have dreamt of a few short years ago. Over the years I’ve listened to, and met, some incredibly talented individuals and speakers. Selfishly perhaps I’ve wanted to bring them all together in an environment where they can inspire others as they’ve done for me. In just under a month, I’m hosting my first event in London and I would love each of you to join me on what I hope will be a day, that does for others what SMX London 2009 did for me. The event is designed to provoke thought, create a community, and inspire everyone to not only achieve what they want to, but what they never imagined possible in both digital marketing, and your individual life paths. I really hope to see you all on the day, and more than anything else, I’d love to hear how you’ve been inspired after the event to do incredible things. If I don’t see you at the event, then please take this one thing from my letter to you today: Just Say Yes. Every opportunity to do something, no matter how daunting it may seem should be jumped on. The decisions you take today will define where you are in five years time. Just Say Yes. If you don’t, then you’ll never truly know what opportunities you’ve missed. (ps. if you do join me at Keynote13, please use the discount code: KNMM13 at checkout. It’s not a discount as such, but rather a charity donation of £25 for every ticket sold). Hey Martin, this post was exactly what I needed to read today! I’m not usually one for gushing blog comments, but you’ve really hit the nail on the head in terms of the potential gains to be made from talking at conferences. SEO (or whatever we want to call it this week) is very much in demand at the moment, good jobs are available and people can earn a good living from it. That’s all very good, but if you really want to propel your career to the next level then speaking at conferences has to be one of the best ways of doing it. The great thing about this ‘route to the top’ is that there are pretty much no barriers to entry; turn up at pub meets, talk to people, ask to talk at the next event and then take it from there. This is one of the main reasons that I started SEOProSco and I’m a bit embarrassed to admit that I’ve neglected it recently. I wanted to give people in Scotland a platform to get started on the conference circuit as it’s often difficult or expensive to get down to the big events in London. I might even get you up to talk at one point! Anyway, you’ve inspired me to get back to organising so thanks for that! ..trying to remember why I couldn’t attend that now….